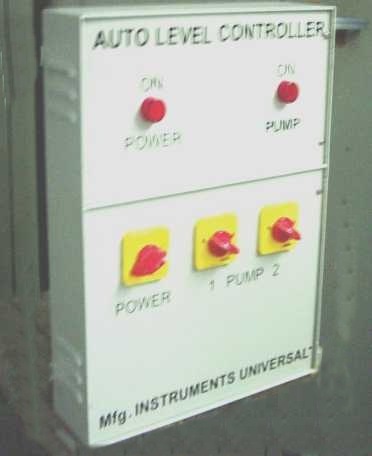 Intelligent level controller can operate pumps whenever liquid level goes below lower level in over head tank/sump/tank then immediately pump will on/off and start/stop when level reach to higher level. It is based on conductivity principal of liquid. It is designed on fully isolated low voltage sensing systems and it is such design that it eliminates salt deposition on electrode. It eliminates routine cleaning of electrode. It is better with comparing other level controller manufacturer who measured level by conductivity base controller, float switch base or membrane type give problems when water salt deposited on electrode, or out side wall and restrict the movement of float. In our systems electrode are open type and sense by conductivity of liquid. Electrode is made from SS 316 to prevent corrosion of atmosphere and it has highest chemical resistance. It is very much cost effective compare to costlier ultrasonic systems. In designing of controller all care has been taken for malfunction of systems by way of electrical noise or false conductivity sensing. It has inbuilt feature of dry run systems for protection of pump seal, or damage the motor winding in case of submersible pump (In submersible pump Winding is cooled by flow of water) by using a pressure switch or conductivity electrode at outlet. Over and above there is a lot of intelligent features describe in features. Installation of Intelligent level controller has many advantages like save energy and wastage of water by, prevent over flow of tanks, and protect the air locking of pump while stop the pump when low level in sump. Also save operating manpower for one or more shift. It can works round the clock without attendance, This system is successfully running in hundreds of residence bungalows, flats and many industries. Also it is working since last more then 10 years at HWP fire water tank control, Reckon Remedies, Hema Chemicals, Asian Petro products, and since last 27 months in Vadodara Municipal Corporation new sewerage plant for three sludge tank at Gajarawadi. We are only approved vendor in VMC. It can replace costly ultrasonic type tank level controller. It can be installed in Utility and effluent treatment plant in Industries, Solar heating systems, for maintaining critical Fire Tank, Sewerage pumping systems Residence colony, Hospital, Multi storied building, Bungalow and many more. We request you to visit our site of Street light controller for energy saving and automation in street lighting.